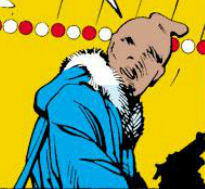 History: (Excalibur I#1 (fb) - BTS) - Bertie, Reg, Sid and Toby donned stocking masks and armed themselves with guns and shotguns, then raided Wally's nightclub in London, taking those inside hostage, but something went wrong, and the police surrounded the club before the gunmen could escape with whatever they had come for. 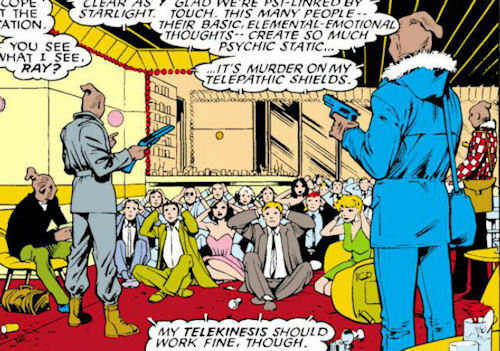 (Excalibur I#1) - The gunmen waited inside the club with over a dozen hostages, unaware that Excalibur members Shadowcat and Phoenix had entered the club via the former's phasing powers. Hidden in a storeroom, Shadowcat poked her head through a wall into the bar and dancefloor area, noting the gunmen's positions and numbers. Her telepathic powers restricted by the psychic static being generated by so many frightened hostages, Phoenix intended to disarm the gunmen telekinetically, but before she could do so she was struck down by psychic feedback caused by a Warwolf murdering a police officer outside. Her scream alerted the gunmen to the presence of someone in the storeroom. Shadowcat hid before they entered, but Reg and Toby found the unconscious Phoenix and took her prisoner too, dragging her into the main room. Improvising, Shadowcat donned a white sheet and played ghost, banking on it spooking the crooks but not so much that they would open fire on the hostages. Seeing the figure fly through a wall drew the gunmen's attention away from their hostages; one, Sid, opened fire on the apparition, but the rounds passed through her and he dropped his shotgun as she pounced on him. As she made contact, she phased him too, so that his hand passed through his shotgun as he tried to grab it back up, and Sid became convinced he had been turned into a ghost. Playing on this, Shadowcat threatened to do the same to the others if they did not surrender and renounce their evil ways. Toby immediately dropped his gun, but Reg and Bertie didn't. However, Phoenix had recovered by this time, and rose into the air behind them wreathed in flames. She destroyed the remaining guns with a wave of her enflamed hand, then telekinetically smashed all four robbers into the wall, knocking them out. Seconds later Captain Britain and the police burst in, having heard the gunshot, and, finding the situation already dealt with, the police took the crooks into custody. Comments: Created by Chris Claremont, Alan Davis and Paul Neary. Bertie was the crook who checked the club's other rooms to make sure no one was hiding in them, and so got told off by Reg when Phoenix was discovered in a storeroom. He was kneeled over the unconscious girl when Shadowcat pulled her ghost trick, and though he failed to drop his gun when warned, his stance suggests this was more out of fear and shock than beligerrance. Regardless, the recovered Phoenix swiftly disarmed him, then stunned him by telekinetically smashing him into his compatriots and a wall. Reg wore a white and red checked jacket. He appeared to be the second in command of the gang, because he berated Bertie for not checking the closet properly and told Toby off for not keeping his mind on the job, but he called out to Sid for help when the group was "haunted" by Shadowcat. After Phoenix revealed her presence in the closet by screaming in pain, Reg was the crook who checked to see who had caused the noise, and he and Toby dragged her unconscious body out into the main room. He didn't drop his weapon when Shadowcat seemingly turned Sid into a ghost, but his terror reached new heights when Phoenix rose into the air behind him surrounded by a corona of fire. 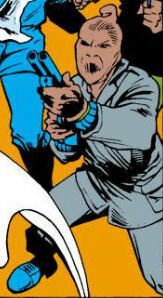 His weapon was destroyed in his hand, and he was flung violently into his fellows and a wall via Phoenix's telekinesis. Sid wore a gray jacket and trousers (pants to you Yanks). He was one of the more belligerent crooks in the gang, and perhaps their leader given his dominant personality, the fact they he got to use a shotgun while his compatriots only had pistols, and that when the "ghost" frightened Reg, he called out to Sid for assurance. Unlike his fellows, he believed they were simply seeing things when Shadowcat loomed over them, and he opened fire on her, but when his shots passed through her without harming her his confidence wavered. As she grabbed at him, he stumbled back and lost hold of his gun, and by the time he tried to pick it up he had been turned insubstantial, so his fingers passed through the weapon, convincing the crook that he had become a ghost. Toby wore a blue jacket and carried a pistol. He helped Reg drag the unconscious Phoenix out of the closet they found her in, and noted that she was a looker, only to be told to keep his mind on business. He was the most freaked out by the "ghost," calling out "Saint's above" and cringing back in fear, unlike the belligerent Sid, and he was the only gunmen to drop his weapon when Shadowcat threatened to turn them all into ghosts, as she appeared to have done to Sid.